Good destination management include development of new products whilst focusing on market development work on the strong foundation branding if a country wishes to attract the top dollar potential tourists said Sri Lanka Tourist Promotions Bureau Chairman Dr. Rohantha Athukorala at the meeting with Zhao Xian Zhang- Chairman International Tour Management Association of the World Religious Charity Foundation at the Sri Lanka Tourist Board. 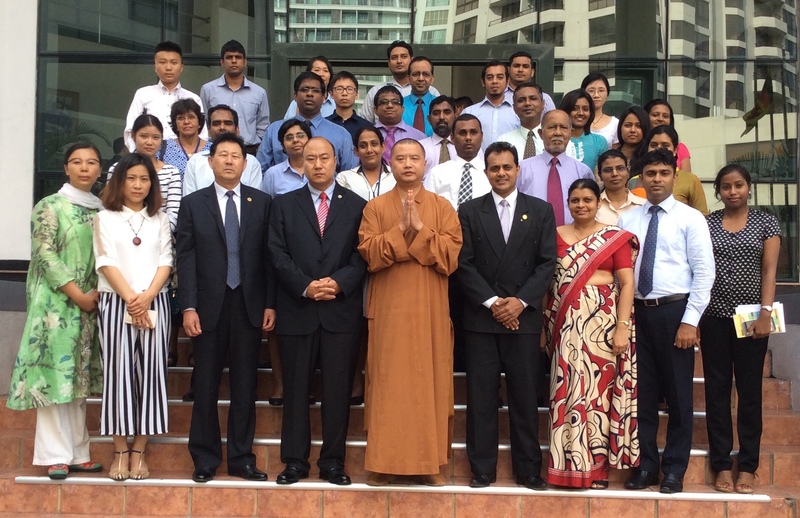 Zhao XianZhang- Chairman International Tour Management Association of the World Religious Charity Foundation with Sri Lanka Tourism Chairman Dr Rohantha Athukorala, Director Marketing-Madubani Perera, Market Head China-Chintaka Liyanarachchi Assistant Director and Randima Udunuwarage together with Key Destination Marketing Companies( DMC's) in Sri Lanka. The latest research reveal that short stays give peace of mind and better tolerance toward the harsh realities and difficulties of our fast-paced lives which is essentially why the religious tourism spike has happened globally said The communique from the Sri Lanka Tourism Promotions Bureau. Specific to China, almost 85 percent of the people in China hold some religious belief or practice some kind of religion is what the Chinese spiritual life survey conducted in 2012 by the Beijing-based Horizon Research Consultancy Group has revealed. The survey also revealed that the growth of Buddhism is extraordinary, with about 18 percent of the 7,021 respondents in the survey claiming to be believers which means that more than 200 million people in the country would believe in Buddhism which gives us a view of the market opportunity said Athukorala. Together with the key Destination Marketing Companies (DMC's) we will develop a new line of tourism which will include a series of above the line and below the line marketing activity he said. A point to note is that the number was around 100 million some years back as estimated by the Buddhist Association of China which tells us the changing dynamics of China said Athukorala that has crossed the 119,705 as at end July 2015 with a registered growth of 77.6% into Sri Lanka. The country is targeting 225,000 visitors for the year 2015 he said.